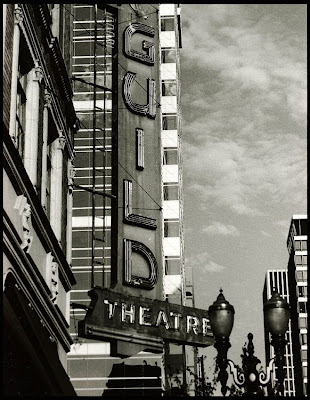 A taste of the city's old style, the Guild's been around for years and has been the site of the Portland International Fringe Theatre Festival. I remember seeing "Do the Right Thing" here one steaming hot summer afternoon just after I'd moved back from New York/New Orleans, and I couldn't decide whether I was in agony over leaving the Apple or relieved to be out of the pressure cooker. I love the Northwest Noir feel of these older buildings, even though everything on the West Coast was built fifteen minutes ago compared to Europe or even Gotham. Tech: Leica M3, Kodak Tri-X developed in DDX and printed on Ilford Warmtone paper.